The earliest book I was given as a child and still own is a first edition of Reginald Turnill’s Observer’s Book of Manned Spaceflight. 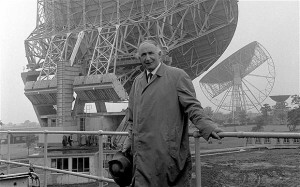 Space, and all that went with it, was important to me in my boyhood, and that made men like Turnill and Sir Bernard Lovell important figures. That whole space world, of late nights, high tech, professionalism and excitement, with its aroma of cigarettes and instant coffee – that would be the world I’d grow up into. Sir Bernard’s recent death – he passed away over the summer, months from his century – reminded me of him and of Turnill and my occasional disappointment that that most modern of worlds had in fact gone almost before I started school. But here’s a fascinating little flavour of it, resurrected by the internet. It’s a recording, made at Jodrell Bank, of Lovell and his team tracking Apollo 11 down to the surface of the Moon – and more especially, tracking Luna 15, the unmanned Soviet craft that the USSR had hoped would steal the American thunder. It was hoped and believed that the Soviets and Americans had cooperated to prevent an unlikely collision, but the tension is there nevertheless. Even when you know the ending, it’s thrilling stuff. And here’s Sir Bernard, telling his life story on Web of Stories. I found the going-to-the-moon shemozzle a bore because I’d read all about it in Science Fiction years before.